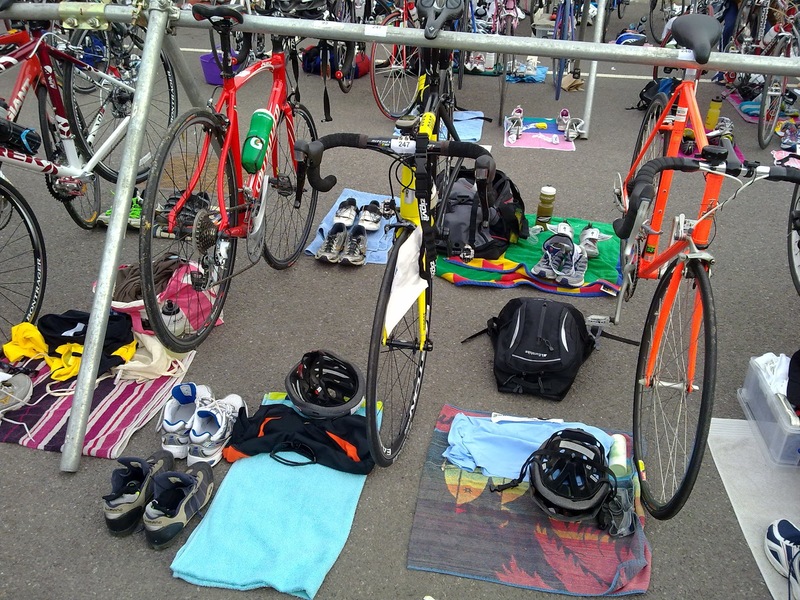 Yesterday I took part in my first triathlon. I was taking part in the novice event. A 250m swim, followed by a 12.5km bike ride and then a 3km run. It was an early start, having set my alarm for 5am. Registration was from 6.45am so I wanted to make sure I was one of the first there so I had plenty of time to get ready. Upon arrival I went and registered. I collected my goody bag and was marked with my race number on my right arm and leg. I then unpacked my bike from the boot of my car and put it together. I put my race number on my bike and another on my helmet and walked my stuff over to transition. Transition for those that don't know is where you store your bike and running kit for the race. For 200 entrants the transition area was much smaller than I imagined. I started laying stuff out trying to visualize how I would go from swim to bike and bike to run. I also took the time to talk to my neighbour in transition. I met a couple of colleagues that were also taking part, although they were both taking part in the longer sprint distance race. One of them is a pro and has been doing triathlons for 25 years and the other is fairly new to it all and did the novice race last year. At 7.50am there was a briefing where they explained the basics and allowed competitors to ask questions. We then walked up to the pool (which was painful on the gritty tarmac) and the swimmers for the sprint distance event lined up around the pool. It was useful to watch them but they were swimming differently to us in the novice race. They were doing 20 lengths of the pool in one lane whereas we would be doing two lengths in each of the 5 lanes. The novice swim didn't start until all of the sprint distance swimmers had finished and this was about 2h15m later. It was a long wait it didn't bother me too much. We were starting in number order and I was one of the first in the pool as my estimated swim time was one of the longest. The marshal started us every 30 secs and it wasn't long before my turn. It took me a while to get into a rhythm but I was steadily going through the lengths. By the time I finished the swim, I'd overtaken the two swimmers that started before me. I got out of the pool and ran the 100m or so to transition. When I arrived in transition, I wiped the dirt and grit off my feet and put my socks on and then my SPD shoes. I put my sunglasses and helmet on, followed by my number belt and grabbed the bike off the racking. This all seemed to be taking ages. I expected to be slow at this though. I ran with my bike to the mount point and started riding. There's a short stretch before a mini roundabout. I had to slow right down as I didn't have right of way but at least I didn't have to stop. The route is a triangle and on the way out the ride is fairly flat and I had a tail wind. I was pushing hard and could feel it in my quads. They were hurting. I knew the pain would go once I warmed up. I turned left onto Shortgate Lane. This was the only real incline. I pushed up the hill but noticed my speed had dropped quite a bit. It was then I saw a cyclist behind me and decided to keep the pace up. I got to a mandatory stop and briefly put my foot down. The cyclist behind me had caught up. As I pushed on, this time down hill but with a headwind, the cyclist behind me hadn't passed. I could only guess that he didn't have enough to pass me without drafting. He soon came by though and was a good few mph quicker than me. He was one of the sprint distance competitors and was on his second lap. It wasn't long though before I had the chance to repass him, so I did. It was short lived though and he came back past a minute later. I soon arrived back at transition and dismounted before the line. When I came to rack my bike in transition before staring my run, I noticed that one of the sprint distance competitors had put their bike the wrong way around in the rack making it difficult to put mine back and also their front wheel was right on top of my stuff. I tried undoing the laces on my SPD shoes and almost got one of them knotted. I put my running shoes on, took my helmet off and turned my number belt around and headed out of transition for my run. Me looking like a pro at the end. I was met at the finish by my wife and two kids. Others came over to congratulate me and I returned the favour to some of the other competitors. As I started walking I noticed my right hip joint was really hurting. Probably caused by the running! I waited around until the end of the race and collected my bike and all the bits from transition. I then decided to have a massage to aid the recovery of my legs. After that I packed my bike into the back of my car and waited for the results to be announced. I was a little disappointed that the winner for the novice event was a 15 year old. I was expecting the competition to be a little older! I wasn't at all surprised though that my triathlete colleague finished 3rd in the sprint race. As he'd already gone home I collected his medal for him at the end. I finished 19th out of 48 finishers. I'm happy with that. You should be very proud mate, that is a fantastic result, not to mention a fantastic achievement being fit enough to think about taking part in the 1st place. Well done Toby, Im honestly very impressed. Well done. Great position to get on your first triathlon. Are you planning on doing anymore? Well done. Good to hear you enjoyed it! Be careful - it can be addictive!! As soon as you start thinking of doing another, you'll know your hooked!!! Thanks for all your comments guys. I'm already looking for my next event. Well done Toby. What an achievement. I cannot even run for a bus!